Building on years of musical training, music therapists come to the profession from many different backgrounds and work in many different ways. 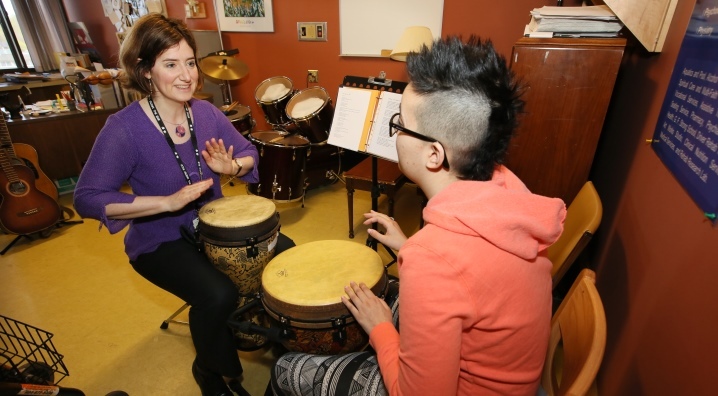 A music therapist is a graduate of a music therapy degree training program approved by the Canadian Association of Music Therapists. Training includes extensive academic and experiential coursework, clinical experience, supervised practicums and a 1000 hour supervised internship. Additionally, a music therapist attains the Certified Music Therapist (MTA) designation by meeting the requirements of CAMT’s accreditation process, and maintaining active CAMT membership. MTA’s must abide by the CAMT Code of Ethics and CAMT Standards of Practice. Above all, a music therapist is a person with strong musical talents and abilities, a dedication to the study of music and its functional adaptations for influencing changes in behaviour, and a commitment to assisting people toward healthy life adjustments. Follow this link to find a music therapist in your area.